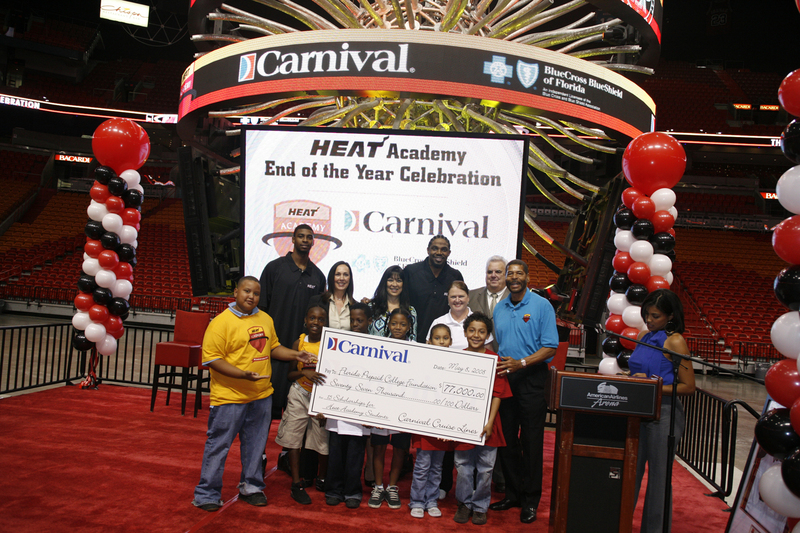 The HEAT Academy – an after-school program for at-risk elementary school students sponsored by the Miami HEAT and Carnival Cruise Lines – recently held an end-of-year celebration for its 300 students at the American Airlines Arena in Miami. During the event, Carnival presented a check for $77,000, which represented a donation by the cruise line, along with a dollar-for-dollar matching contribution provided by the Florida Prepaid College Foundation. The monies will fund 15 scholarships for HEAT Academy students. The scholarships will mature in 2015, coinciding with the students’ high school graduation. On hand to present the check were Carnival’s Senior Vice President of Air/Sea Operations and Corporate Training Roberta Jacoby and Carnival Foundation Director Linda Coll. To date, the cruise line has provided a total of 75 scholarships to HEAT Academy students with a total estimated value of more than $350,000. Carnival’s support of the academy also includes an innovative mentoring-in-the-workplace program in partnership with Big Brothers Big Sisters. Through the program, high school students who attend the HEAT Academy are paired with a member of Carnival’s management team and shadow them throughout their workday to get a first-hand look at the business world.